Doesn't give me much time to book my flight and cover work but appreciate you getting 3 tickets. Someone asked why I didn't change my signature but it has been there all season and you do not mess with Karma. Served me well for the regular season and have no reason to doubt it's continued affect. Strikes fear in the HTW Bruins fan club. I'll poke that bear. With a loaded gun that is. So are the sayin' that they will beat Boston in double OT? I'll take it. They took out last year's Champs and the supposed unbeatable goalie in 5 games and chased him from a game. Tuki Tuki (George of the Jungle's bird) has been good without a doubt but let's remember that Toronto came real close to beating him and the Bruins. Not quite the brick wall that some make him out to be. Chicago had their moments vs Detroit also so nobody is perfect. Crawford leads the Hawks to being the best defensive team and yet gets less respect. He must be doing something right. Let the games begin! I agree about the 3 day layoff between games. Damn TV and the need for Saturday games. No consideration for the fans and the stress the layoffs cause. It is like torture for Boston as it will drag on their agony of defeat. I knew that LA would score because I had to get up early the next day and needed double OT like a hole in the head. Also had complete faith in the win and had a feeling it would be Kane scoring. Sorry, that's all I got tonight. Waaaay too much time between games!!! Bruins in 6 games. Boston is a steamroller at this point. I don't mind the delayed start but why three days between games 1 and 2? They also have games 2 and 3 on NBC Sports channel I had to upgrade my dish package just to get that bs channel and most homes don't have it. 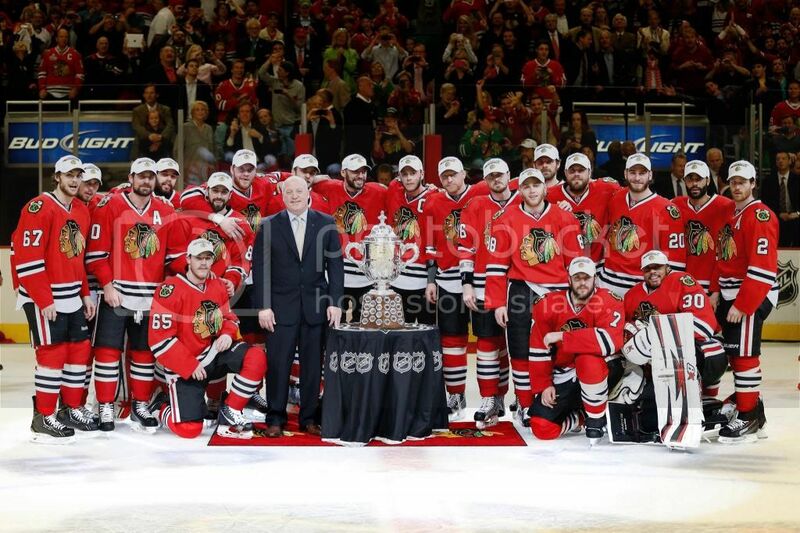 Hawks in 7 .. most experts I hear believe the western Conference is tougher. I'm so jealous...even though you are rooting for the wrong team. Seriously, enjoy the game and soak up the atmosphere, such a special time for a hockey fan! This is gonna be a long day, 8pm can't come soon enough! Chicago has been adapting all season which is why they were so dominant. That is part of the beauty of their team. Well rounded and can handle all styles. All 4 lines can hurt you and in many ways. The Pens never win a 1-0 game or 2-1 but Chicago sure can. I wish Sang was my Dad. I love greek food and the Hawks! have fun and bring us some good luck. Someone mentioned earlier about Phil and Tony O dropping a puck. There was an article in the paper and Phil is cheering for Chicago and has no love for the Bruins. Here’s a look at who’s picking whom ( link). Matt Pepin: Blackhawks in 7: I expect one intense game after another, just the way a final series should be. Steve Silva: Bruins in 6. Tuukka stays solid. And Tyler Seguin scores a goal or two. Zuri Berry: Bruins in 5. The Bruins' defensive mastery is reminiscent of the team's 2011 Stanley Cup Final series with Canucks. Chad Finn: Bruins in 6: As penance for losing, all blasphemous photos of Bobby Orr as a Blackhawk must be removed from the United Center. Gary Dzen: Bruins in 6. The Bruins are too balanced and Rask is playing too well for the Blackhawks to win. Globe staff: Four out of four pick the Bruins. Foxsports.com staff: Six out of 10 pick the Bruins. 98.5 The Sports Hub staff: 16 out of 19 pick the Bruins. NHL/NHL.com staff: 12 out of 19 pick the Blackhawks. New England Hockey Journal staff: Four out of four pick the Bruins. CBS Sports.com staff: Two out of three pick the Blackhawks. ESPN staff: Nine out of 12 pick the Bruins. Seems like Stanley Cups are won predominantly be goaltending. Right now Rask is playing head and shoulders above Crawford IMO. Plus, if the B's defense continues to clamp down the way the did against the Pens (2 goals against in 4 games was just mindblowing) the Hawks have no chance. Bruins in 5. Now, that said, anyone who knows my history of making predictions should race out and load up on the Hawks. You get the same odds with either team if you pick them to win in 7 They think the Hawks are more likely to win a short series. Didn't know Sang was taking his son to a double header and I don't think he knew either. Hope they don't have to work early. What a game that was! And some question whether a hockey player is the best all around conditioned athlete. Almost two games worth of ice time, hitting each other like trains, now the 3 day lay off makes sense. Does that count as two wins in the series? Could have gone either way. Gonna be a great Final obviously. Chicago doubled the Pens production in one game. Still think they can't score on Rask? Both goalies were awesome tonight. Probably dropped 15 lbs each.